Compare Blood Pressure Monitors: Omron, Panasonic, Withings, iHealth or Lifesource? There are two major types of blood pressure monitors for home use. Those that are worn above the elbow around the upper arm, and those that are worn around the wrist. You may wonder which one works better. Though the majority of clinically validated monitors to date are upper arm monitors, a number of wrist monitors have now also been clinically approved. However, a wrist monitor, no matter how well designed, could still show inaccurate readings, if the wrist is not held at heart level at the time of measurement. The problem is that even a tiny difference in the height of the wrist monitor with respect to the heart can show major inaccuracy in the reading. So, to avoid any potential errors that could lead to tragic consequences, it is recommended by the American Heart Association to get upper arm blood pressure monitors for home use. A wrist monitor should be used only in those cases where the arm is so large (due to obesity or overdeveloped muscles) that no monitor with a cuff large enough to fit around the upper arm can be found. This article will compare five of the best and most popular blood pressure monitors: Omron BP786, Panasonic EW3109W, Withings BP-801, iHealth Feel BP5 and Lifesource A&D UA-1030T. Note that two of these (Panasonic and Lifesource) are standalone units, while the other three can be used in stand alone mode as well as in conjunction with your smartphone or tablet. ​Note 1: "Yes" means that the BP monitor cuff can be adjusted to fit both standard arm sizes (9" to 13") and large arm sizes (13" to 17"). Note 2: The Bluetooth protocol provides wireless communication between the BP monitor and other Bluetooth supporting devices such as a smartphone. Note 3: For better precision, certain BP monitors take automatically more than one measurement and display their average as the final reading. Note 4: With the term "wireless" we mean that the unit can communicte with your smartphone or tablet via Bluetooth with no wired connections. Note 5: The prices shown are Amazon prices in effect at the time this article was written and may have changed. For exact price information, please click the product image links in the Amazon section below. Note also that the Amazon price often includes a good discount on the list price. If a discount exists, both the list price and the Amazon price will be shown when you click the product image links in the Amazon section below. Designed to work wireless both with Apple iOS and Android devices. Both blood pressure and pulse rate readings are provided. A multi-color indicator lights show if the readings are in the normal (green) or hypertension (orange) range, and irregular heartbeats are detected while the blood pressure is being measured. The unit takes automatically three consecutive readings one minute apart and displays the average. Two different users can monitor and track their readings separately in the stored memory. Up to 100 readings per person can be stored in memory (200 in total). Using Bluetooth Smart the monitor connects wireless to your personal online dashboard for a digital record of your blood pressure readings which allows easy tracking of your progress. Using Bluetooth Smart and the free Omron Wellness app, readings can be synced wireless to a smartphone (or other mobile device) so you can access them anywhere and anytime. The mobile app can hold an unlimited number of readings..
A blood pressure level indicator shows how the reading compares to internationally accepted standards for normal blood pressure levels. The patented arm cuff expands to fit both regular and large sized arms (the Omron ComFit cuff fits both standard and large size arms from 9 to 17 inches). An indicator confirms the cuff has been wrapped correctly around the arm. The monitor is compatible with iPhone 4S & higher, iPad 3 & higher, iOS 7+ as well as with Samsung Galaxy S III & higher, Android OS 4.3+. The monitor comes with one AC adapter, but it can also operate with 4 AA batteries which are not included. A quick start guide with instruction manual is also included. First portable arm unit in the industry. 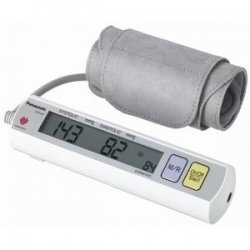 The blood pressure monitors produced by Panasonic are, like the Omron monitors, among the most popular on the market. This is because they're very easy-to-use, produce accurate results, and are very reasonably priced. EW3109W is the most popular of all and the first portable arm unit in the industry. It offers many useful features, but no PC connectivity. 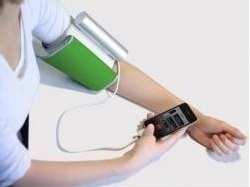 It produces accurate readings of blood pressure and pulse rate thanks to sensors that detect and isolate only essential pulse oscillation, getting rid of noise factors which can cause inaccurate measurements. A flashing alert system lets the user know if the blood pressure reading is high or hypertensive. The comfortable cuff, designed to assure correct use, rolls around the stick-style monitor for portability. The standard cuff fits arms up to 15-3/4". A 17" extra-large cuff is also available but sold separately. The monitor has a large LCD display with automatic memory that can keep track of 90 readings. It also has an averaging feature which allows the tracking of readings over time. With only a touch of the start button, the monitor auto-inflates making it very easy to use. It comes with a carrying pouch and 4 AA batteries. An optional AC adapter is sold separately. Note again that this unit does not connect to your PC computer for display, storage of data or tracking purposes. Measures blood pressure as well as heart (pulse) rate. Syncs wirelessly with Apple iOS and Android smartphones and tablets using Bluetooth wireless connectivity or your smartphone's cable (comes with a micro-USB adapter). The iOS and Android Health Mate app stores all measurements, syncs with the Withings Health Cloud and displays an easy to understand chart/graph. It offers comprehensive and streamlined data tracking. You can visualize your stats on your Apple iOS or Android device as well as on your online dashboard on your Mac or PC. The data is always backed up so there is no risk of losing prior measurements. Has multi-user capabilities with personalized monitoring and data for each user. Allows easy data sharing with doctors and readings are automatically compared to World Health Organization blood pressure standards for an easy understanding of your data. It is Apple Watch Compatible: you can use your Apple Watch to easily start a measurement on your BP monitor and also to view your last measurement and overall trends at a glance using the Health Mate for Apple Watch. 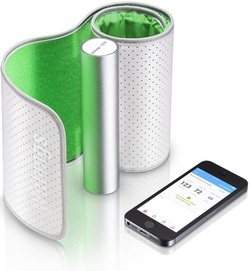 iHealth Feel BP5 blood pressure monitor is designed to work with both Apple iOS and Android devices. But being wireless, with no plugs or connections to manage, this blood pressure monitor makes it easy to check your own blood pressure, anytime and anywhere. Using the free iHealth mobile app, you can measure and track your systolic/diastolic numbers, heart rate, pulse wave and measurement time. You can then share your results instantly with your doctor, family or friends. The unit weighs 4.8 oz. (135g) (excluding cuff ), and its standard cuff fits upper arm circumferences of 8.6” to 16.5” (22cm to 42cm). A simple and elegant interface. Bluetooth 3.0 wireless support enabling use with most Apple iPad, iPhone and iPod touch models as well as Android devices, so you can easily monitor and share your results. Recording your blood pressure readings (systolic/diastolic numbers), heart rate and pulse wave. Integrated app that includes personalized health tools to provide a customized experience. The app makes it possible to check your readings and changes in blood pressure, in custom graphs created by date and time or by systolic/diastolic numbers for simple categorization. Colorful, easy-to-read displays let you view your historical readings and World Health Organization classifications. Keeping track of physical activities and daily diet as part of your overall health. Sharing results instantly with friends, family, or your doctor. Capacity to hold unlimited number of user profiles to allow you and your family to track your statistics together. Note that this monitor can also be used offline without an iOS or Android device. To do that you just have to enable offline measurement in the “device settings” of the app. The free iHealth app can be downloaded from the App Store in iTunes. Lifesource UA-1030T blood pressure monitor allows you to quickly and easily take your blood pressure and pulse. The monitor takes three consecutive readings and provides an average. It can store up to 90 readings, making it possible to track blood pressure and pulse data over time. Readings are marked with time and date stamp which facilitates the review of previous readings. It can also average previous readings to give you a good understanding of your progress. In addition to providing blood pressure measurements, it has a pressure rating indicator that displays whether your blood pressure is high, low, or normal, and a symbol that alerts you when your heartbeat is irregular. What makes this monitor special compared to other brands discussed above is that, in addition to displaying your readings, this monitor is equipped with an audio option that can give verbal readings in English, French, or Spanish. Verbal instructions are also available. The monitor's SmoothFit cuff is designed to seamlessly conform to the user's arm and give the most comfortable experience possible. The cuff inflates automatically at the press of a button. The monitor comes with an auto-inflating SmoothFit cuff, an English/Spanish quick start card, a storage case, four AA batteries, an AC adapter, and trilingual instruction manual (Spanish, French, and English). So which Blood Pressure Monitor to buy? When you compare BP monitors, the five brands reviewed here are clearly among the best blood pressure monitors available today. You should normally be quite satisfied with the quality of these products, the reliability of their measurements, and their ease of use. 1If you are an Apple iOS device user (such as iPhone or iPad) or an Android smartphone or tablet user, and you are looking for a wireless BP monitor, you could consider any of Omron BP786, Withings BP-801 or iHealth BP5 BP monitors. As all three BP Monitors provide similar features, price might be your deciding factor. 2If you have vision problems, and you need a BP monitor that can talk, you should choose the Lifesource UA-1030T which is the only one that can give optional verbal measurements. 3If you are not interested in connectivity to smartphone or tablet, and you have no vision problems, then consider the more traditional Panasonic EW3109W, and you will be saving quite a bit of money. Please click the blood pressure monitor of your choice below for exact price information or to purchase. Note that Amazon usually provides a good discount with respect to the List Price (both the List Price and the actual Amazon price will be shown when you click the products below). ​Have you found yet what you were looking for?